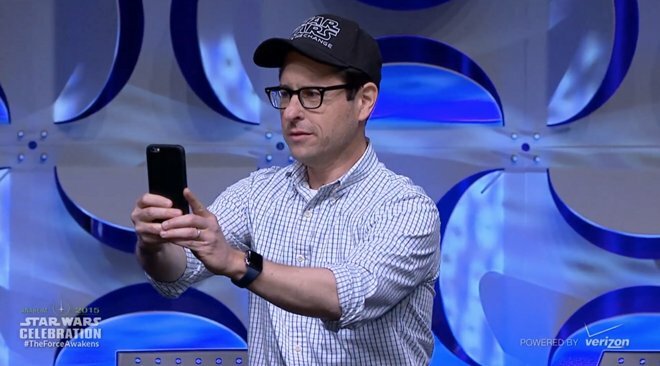 During a promotional stop for Disney's upcoming Star Wars: The Force Awakens, director J.J. Abrams flashed what appears to be a stainless steel Apple Watch during a panel discussion at the Star Wars Celebration in Anaheim. Abrams was apparently sporting the 42-millimeter version with a dark blue sport band, an option not offered by Apple to the public. He also took the stage with an iPhone 6 Plus inside a protective case, which he used to take a panoramic shot of the audience. This marks the second time in as many days that a bespoke Apple Watch has shown up on the wrist of a celebrity. Fashion icon Karl Lagerfeld appeared with an Apple Watch Edition with a solid gold link bracelet on Wednesday. A number of other celebrities, including Drake and Pharrell Williams, have been spotted with Apple Watches of their own in the days leading up to the device's public release. It's unclear what criteria Apple's worldwide product marketing department is using to decide which celebrities are granted early access. The Apple Watch went on sale last week, and deliveries are slated to begin on April 24. Between 1 million and 2 million units are thought to have been sold over its launch weekend.